You can make predictions about certain behavior patterns of an atom and its electrons based on the position of the atom in the periodic table. All the periodic trends can be understood in terms of three basic rules. 1. Electrons are attracted to the protons in the nucleus of an atom. a. The closer an electron is to the nucleus, the more strongly it is attracted. b. The more protons in a nucleus, the more strongly an electron is attracted. 2. Electrons are repelled by other electrons in an atom. So, if other electrons are between a valence electron and the nucleus, the valence electron will be less attracted to the nucleus. That’s called shielding. 3. Completed shells (and to a lesser extent, completed subshells) are very stable. Atoms will add or subtract valence electrons to create complete shells if possible. The atoms in the left-hand side of the periodic table are called metals. Metals give up electrons when forming bonds. Most of the elements in the table are metals. The elements in the upper right-hand portion of the table are called nonmetals. Nonmetals generally gain electrons when forming bonds. The metallic character of the elements decreases as you move from left to right across the periodic table. The elements in the borderline between metal and nonmetal, such as silicon and arsenic, are called metalloids. The atomic radius is the approximate distance from the nucleus of an atom to its valence electrons. Moving from left to right across a period, protons are added to the nucleus, so the valence electrons are more strongly attracted to the nucleus; this decreases the atomic radius. Electrons are also being added, but they are all in the same shell at about the same distance from the nucleus, so there is not much of a shielding effect. Moving down a group, shells of electrons are added to the nucleus. Each shell shields the more distant shells from the nucleus and the valence electrons get farther away from the nucleus. Protons are also being added, but the shielding effect of the negatively charged electron shells cancels out the added positive charge. Generally, when electrons are removed from an atom to form a cation, the outer shell is lost, making the cation smaller than the atom. Also, when electrons are removed, electron-electron repulsions are reduced, allowing all of the remaining valence electrons to move closer to the nucleus. When an electron is added to an atom, forming an anion, electron-electron repulsions increase, causing the valence electrons to move farther apart, which increases the radius. Electrons are attracted to the nucleus of an atom, so it takes energy to remove an electron. The energy required to remove an electron from an atom is called the first ionization energy. Once an electron has been removed, the atom becomes a positively charged ion. The energy required to remove the next electron from the ion is called the second ionization energy, and so on. 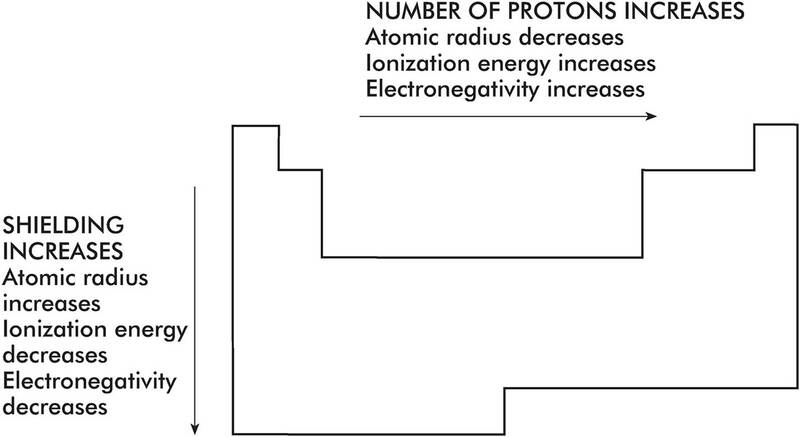 Moving from left to right across a period, protons are added to the nucleus, which increases its positive charge. For this reason, the negatively charged valence electrons are more strongly attracted to the nucleus, which increases the energy required to remove them. Moving down a group, shells of electrons are added to the nucleus. Each inner shell shields the more distant shells from the nucleus, reducing the pull of the nucleus on the valence electrons and making them easier to remove. Protons are also being added, but the shielding effect of the negatively charged electron shells cancels out the added positive charge. When an electron has been removed from an atom, electron-electron repulsion decreases and the remaining valence electrons move closer to the nucleus. This increases the attractive force between the electrons and the nucleus, increasing the ionization energy. · For each element, when the valence shell is empty, the next electron must come from a shell that is much closer to the nucleus, making the ionization energy for that electron much larger than for the previous ones. · For Na, the second ionization energy is much larger than the first. · For Mg, the first and second ionization energies are comparable, but the third is much larger than the second. · For Al, the first three ionization energies are comparable, but the fourth is much larger than the third. · Moving from left to right across a period, electronegativity increases. · Moving down a group, electronegativity decreases. The various periodic trends, which don’t include the noble gases, are summarized in the following diagram.